The marketing campaign for Star Wars: The Force Awakens was full of misdirections, including the tease that Finn would be the series' central protagonist. While the character proved himself to be incredibly heroic, actor John Boyega may have teased he'll embrace his lightsaber-swinging side in Star Wars: Episode IX. Over on Twitter, one fan posted, "Hopefully my man John Boyega will truly shine in IX and the Finn character will be shown as the badass hero I've been waiting for him to be since VII. ..and hopefully he'll wield a saber again.."
Boyega replied, "We’ve got you in this one bro! TRUST me!" 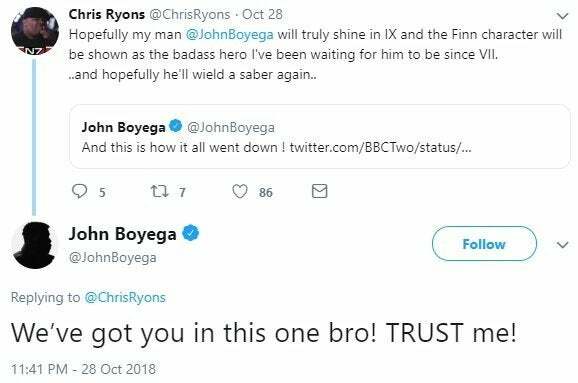 While the first half of the tweet seems to merely claim Finn would surely be a hero in the upcoming film, Boyega's emphasis to trust him in the second half of the tweet definitely feels like he's teasing that Finn's time with a lightsaber isn't entirely behind him. This isn't to say that Finn will become a Jedi, nor that Finn would competently use the weapon, though this tweet gives us the suspicion that the hero could borrow Rey's lightsaber, if only momentarily. Early promotional materials for The Force Awakens depicted Finn wielding a lightsaber from the film's final scenes, leading many fans to believe the character would be the focal point of the saga. Instead, we learned Daisy Ridley's Rey was the burgeoning Jedi, delivering audiences many fulfilling surprises. With the episodic Star Wars films often being referred to as the "Skywalker Saga," another surprise was that Rey wasn't a descendant of the heroic family, but that it was Kylo Ren who was a Skywalker, being the son of Leia and Han Solo. Episode IX hits theaters in 13 months and little is known about the project, though Boyega previously teased that the film will deliver immense action. Stay tuned for details on Star Wars: Episode IX before it hits theaters in December of 2019. Do you think Boyega's comments mean he'll use a lightsaber? Let us know in the comments below or hit up @TheWolfman on Twitter to talk all things Star Wars and horror!